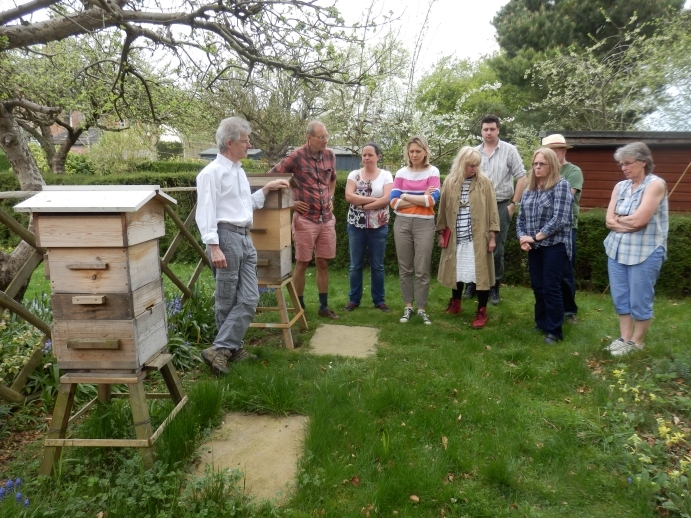 Lured by chocolate brownies, ten of us gathered at Brian and Faith’s house in Summertown to prepare for the impending swarm season, view their hives, and meet like minded enthusiasts. Anecdotally, we hear the long winter, featuring a false start at the beginning of April followed by a harsh cold snap, has resulted in heavy losses among local beekeepers. The losses we’ve heard of have primarily been in National hives. I’d hoped the long winter would mean few wasps survived, but we’ve all seen several queen wasps recently. Will had an interesting report about a hive which was especially vulnerable to wasps (which eventually overwhelmed it) because it built its brood nest at the back of the hive, meaning the entrance wasn’t as heavily patrolled by guard bees. Over the last three years our group has collected about a hundred swarms. We pool and compare experiences. Ensure you have a hive ready to accept one! Use bait hives to attract swarms without effort. These need to be in a desirable position (ideally south facing, shaded from above, above head height), have sufficient volume, and smell attractive, ideally using propolis, brood comb, and a touch of lemongrass oil. Jack uses a removable wooden block to carry the lemongrass scent, so it doesn’t overpower a queen’s smell if a swarm does move in. He has had 3 swarms move into his own bait hive, but he is near a bus route and the vibration makes them abscond within hours. Your swarm kit should include secateurs, a white sheet, protective clothing, a ventilated box, duct tape, a feather or bee brush, a smoker or a scent such as dilute peppermint oil to mask alarm and queen pheromones, water (to drink!). You can usually borrow a ladder, if needed, at the site. Walk away from swarms which are inaccessible. It is always tempting to go for a swarm which is out of reach, but there are lots of swarms in this area. Swarms are heavy and ladder safety is important. Bees can be knocked or shaken or brushed into the collection box, the key is to get the queen in and the rest will follow over a half hour or so. Sometimes the queens are difficult to get in (hidden inside a bush) in which case, place the box upside down, above the main clump because queens will move towards darkness, which they view as safe. However this only works if the queen is aware of it – she can’t see from the middle of a cluster – so you may need to disturb the cluster so she sees it. Disorderly swarms, or ones in two or more equal sized clumps, probably have multiple virgin queens and you need to catch both. They are likely to be sisters from the same colony so the workers will get on, but the queens may not. The best option (in my opinion) is to capture them in separate boxes – the queens won’t want to be in the same box – then hive them into the same hive, perhaps putting a queen excluder on the entrance so neither queen can abscond, and let the queens sort out who’s boss. This will give you one large colony which is much more likely to thrive than two small ones. Try to get as many bees as possible – plan for the collection taking all afternoon. You may be able to leave the box there and return in the evening, but in my experience kids will throw rocks at an unattended box! After transporting home, leave the box of bees to calm down for a few hours in a cool, ideally dark place. You can leave them in the box for a couple of days if the weather is heavy rain (unsuitable for hiving). Hiving is best done an hour before sunset so the bees see the hive as the best option for staying warm. We debated the pros and cons of just knocking them into the top of a hive, versus walking them in up a sheet. Both options work. Brian has built a simple swarm lure at head height in front of his hives, with a detachable “branch”. This is a technique we learned from Gareth John, who tells us it is best to make the stick they settle on out of oak, which bees are strongly attracted to. He made a dodecagonal double walled hive last year which he hoisted into a tree. It was almost immediately occupied by a swarm, which saw it as a very desirable location! This colony did not make it through winter, but that gave us the opportunity to peer inside while he refurbishes it. It’s about 80cm tall and weighs 20kg; the entrance is towards the bottom of the picture. He is also working on a “smart hive” which will log temperature in the quilt, outside, and 3 points inside the hive every few minutes. The hive is just beyond WiFi range from the house so it stores info on a memory card. In the next picture you can just about see a wiring channel he has cut into the middle bar and the side of the box. Around the same time I heard Warrés as boring because you can’t inspect and fiddle with them, I opened my TBHs to move comb around – this is needed to make room for brood at this time of year to prevent unnecessary swarming (which can occur if the brood nest feels crowded). First of course I watched the entrances, hefted the hives etc and determined they were queen-right, raising plenty of young, had no signs of disease or predation, lots of stores. Whilst the hives were open I decided to do full inspections because I do them so rarely, and I was probably feeling guilty about all the strongly worded advice that you must do it in Spring to look for disease etc. Apart from enlarging the brood nest volume, all I managed to do was kill bees and upset them. I learned nothing I didn’t already know from external observation. Comparing tales of woe, it seems several of us have made the following mistake when collecting swarms: bees are often knocked to the ground when shaking a swarm loose. They fly, or often walk up to rejoin the swarm, and they can get trapped in your clothing if it has an open edge pointing downwards. Although swarming bees don’t normally sting, they will if they are trapped and panicking. The diagram shows common routes of ingress. 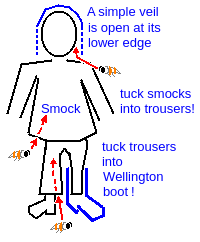 Getting stung in the crotch is particularly awkward as you may have to remove trousers to remove the sting. I’ve found that only 50% of casts I collect make it through their first season, so this year if I collect one I intend merging it with another to ensure they have enough bees to build up properly for winter. This way at least one queen’s line will be preserved. Occasionally we catch exceptionally large swarms. These can abscond, and we suspect it’s because they feel cramped if they are hived in the normal way. For such swarms, (1) give them an extra box and (2) temporarily remove the bars from all but the top box, so they have a large free volume inside the hive. 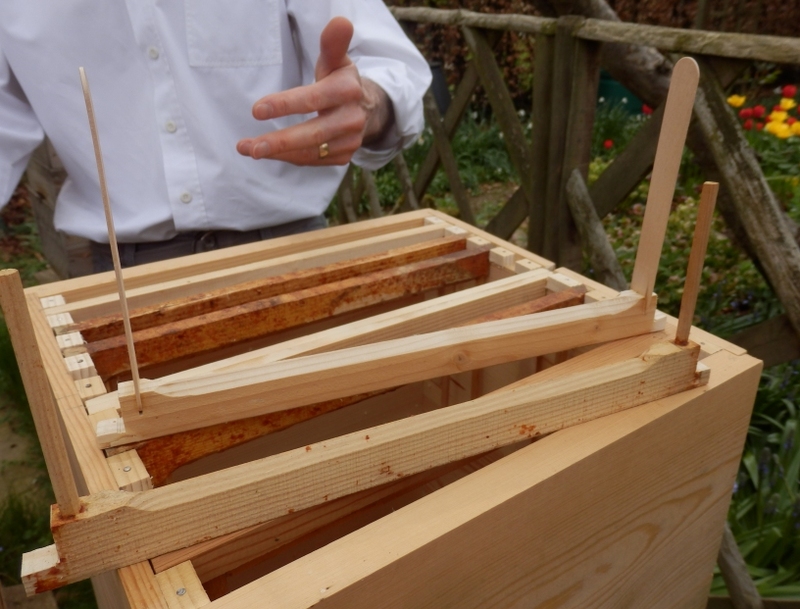 (3) Replace the bars once they’ve committed to the hive – after a few days. Several of us have lost hives over winter and although sad, the post-mortems are a great opportunity to learn. We have been sharing photos of what we’ve seen with other local natural beeks and discussing conclusions. Many thanks to everyone who came along, and especially Brian and Faith for sharing their house and apiary. This entry was posted in Meetings, Swarms, Warré and tagged Smart hive, temperature. Bookmark the permalink.